Here I am describing to the reader's community, the workflow of the attendance management system in Educational ERP, a comprehensive and integrated tool that efficiently and seamlessly manages the school management functions. 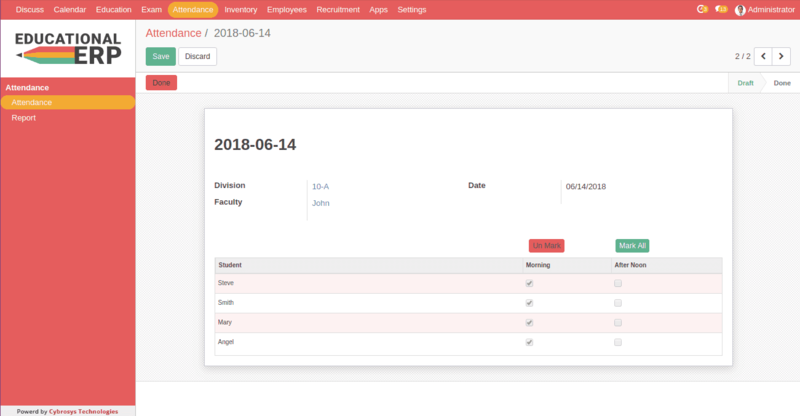 This module features the student attendance system. As we know, for an educational institute, the attendance system is very important to track the students and their growth. Educational ERP attendance system effectively manages both morning and afternoon attendance of the students. 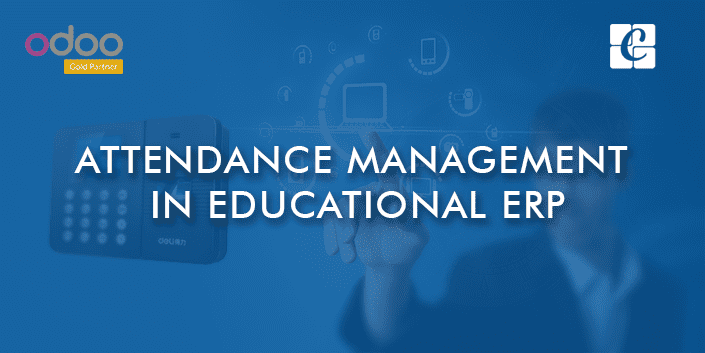 Let us analyze the workflow of Attendance Management module step by step. 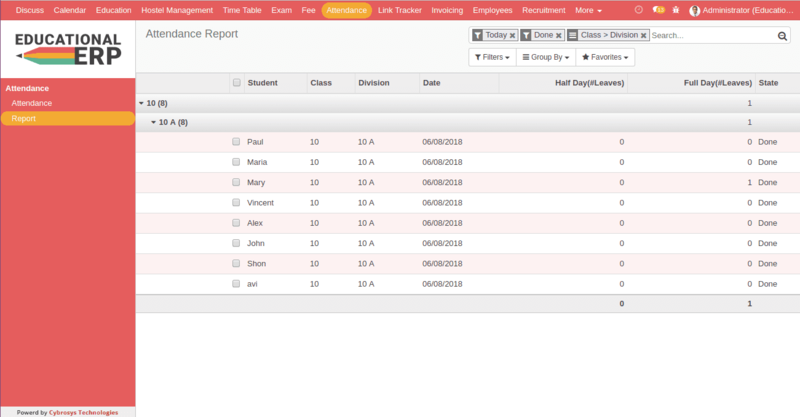 Here you can create an attendance table, by providing the details like the class division and the date for which the attendance to be managed. You can also select the designated Faculty responsible for handling the student attendance. note: The faculty field is not mandatory. Either you can fill or omit the field. 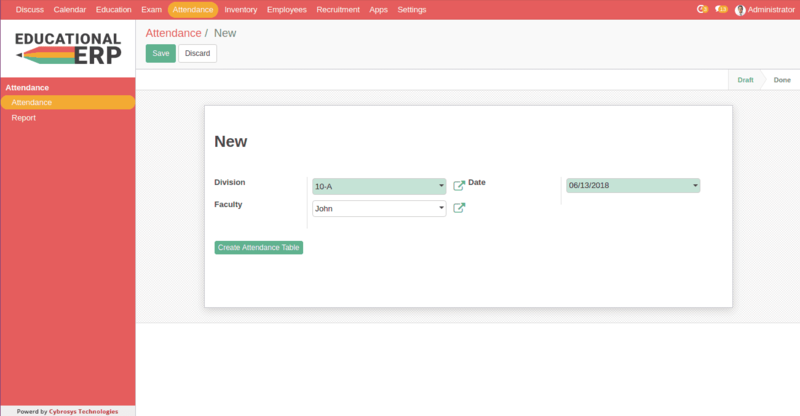 Once you are done with the first step, you can click the button in the form view named Create Attendance Table. Here you have provided with the list of all students belonging to that division and also two fields for marking the morning and afternoon session attendance. The end user is also facilitated with the option to mark all students attendance and also unmark them later upon. If the attendance table is already created for that division on the selected date, you will get a warning stating that the attendance table is already created for that division on the prescribed date. 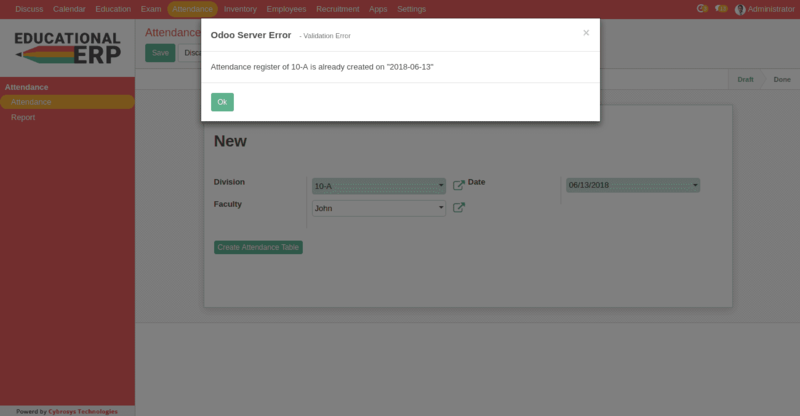 After completing the attendance entry for both morning and afternoon session, one can move the attendance table to a done state by clicking the Done button above in the form. You are also provided with the option to modify the attendance table. For that click the button in the form called Set to draft. This button moves the attendance record from done state to Draftstate. Then you can modify the attendance table. In the done state, you can’t edit the attendance table. This is the workflow of attendance management in Educational ERP. You also have the reports of attendance records. You can filter it by class wise, division wise etc.